What a year! We are just finishing up with production for Kiwis Can Fly and I just want to say a massive thank you to the team. Everybody put so much into this project and we have ended up with something truly amazing, especially for 6 students! I’m looking forward to whatever the future has in store for all of us. Things are really starting to pick up work wise. The team and I are trying to get through all of the animation as quickly as possible to give our rendering TD/all round superman, Kyle Phan, enough footage to send to the render farm over the holidays when all of the computers will be empty. Which means we have a week left to get too much work done. We're cutting it pretty close but I'm sure we can get through it. 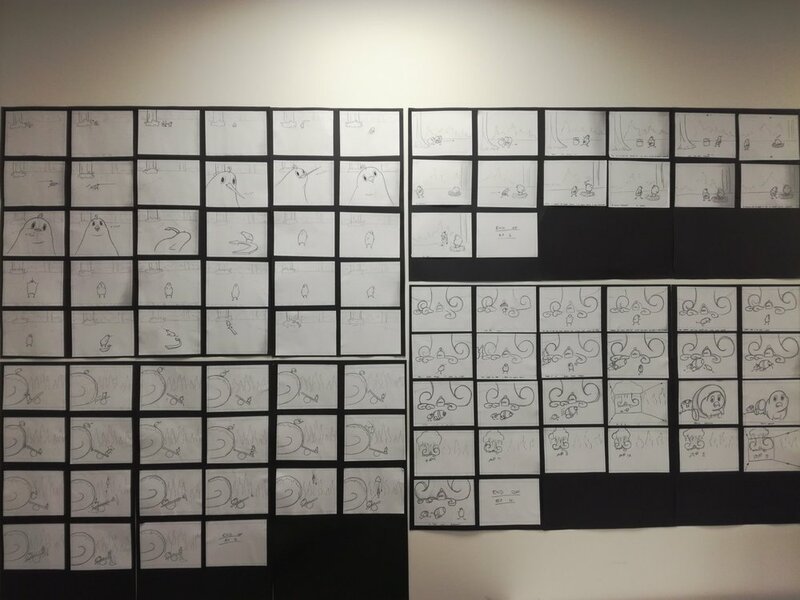 Anyway, here's a picture of all of the drawn storyboards, I'll upload some of our shots when we have them finalized. But even through the render tests, it's looking pretty cool. I guess that's all for now, back to the 15 hour days! It's crazy to think that I'm already through the first semester. The amount of work that the Kiwi's Can Fly team has achieved in just 12 weeks is incredible, and in our pitch to the second year students yesterday, it was great seeing it all come together. We have two gorgeous characters modeled, rigged, and in the middle of being textured, which had an amazing response from tutors and students. We also have all of the storyboards drawn for the four episodes of our show that we will be making this year and two of them have been made into full animatics. Over the holidays I will be working on the last two animatics, as well as working out the lighting which we will be using in the final product. All in all, a pretty exciting year so far and there is so much more to come. I have been dreading making the first post on my blog because I know that I have to keep posting regularly. But on Monday 16th, we had James Partridge come in to give us a lecture about the importance of getting ourselves out there and doing this kind of thing, so this is probably the best point to start. Thanks to James Partridge for kicking off this half semester with some motivation!